Last weekend, the kids I babysat introduced me to the Jelly Belly Beanboozled board game right before dinner, with parental permission of course. 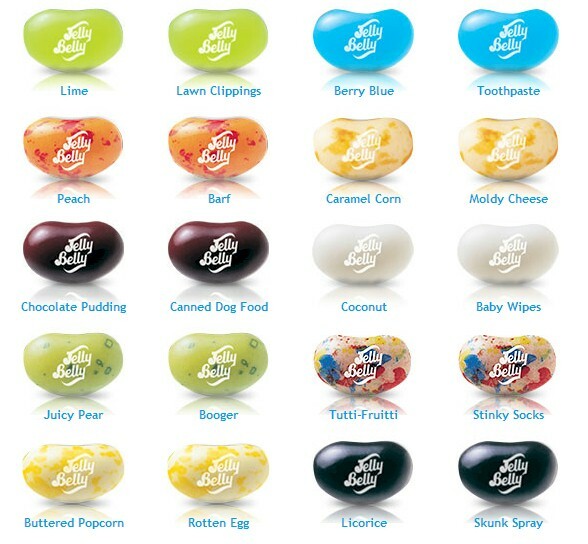 I was told that you spin on your turn to decide what color jelly bean to try. Then, one of two similar looking but different tasting flavors could be yours. The kids each had spitting cups in case a flavor did not work out, based on their prior experience. The first “negative” flavor I experienced was on my fourth turn. I picked the canned dog food instead of the chocolate pudding flavor since I listened to the wrong kid. The kids, however, were shocked that I didn’t think it tasted bad at all. Ironically, I thought it tasted pretty good, like a juicy, well-marinated piece of stir-fried pork. I probably liked it because I am a protein metabolic type and naturally crave meats often. Just as there is no one particular workout routine that fits all people, there is no one diet that suits all people. Those who advocate for metabolic typing believe that each person has a unique metabolism and specific foods affect each person differently. The theory is that we should eat foods aligned to our metabolic type to improve our well-being. Most practitioners believe there are three different metabolic types. Type A is the protein type, type B is the carbo type, and type C is the mixed type that is somewhere in between. To find out what your personal metabolic type is, take the interactive metabolic typing quiz here. After you take the quiz and find out your results, read the explanations below. As I mentioned, I am a type A (protein type). Protein types tend to crave fatty and salty foods. They should consume plenty of high-density, high-fat proteins. Think nuts, steak, red or darker meats, fish, whole milk, eggs, cheese, etc. Protein types are one of two things: either they possess fast oxidizers that burn carbohydrates too quickly or the parasympathetic branch of their autonomic nervous system is more dominant than the sympathetic branch. This means that the part of their nervous system that regulates the body at rest is stronger than the part of their nervous system that regulates the fight-or-flight response. Although too much processed sugar can increase anxiety levels for protein types, this does not mean that they should not eat carbohydrates at all though. Protein types should eat a variety of fruits and vegetables, picking starches from whole grains. Overall, their meals should probably consist of 50% proteins, 30% fats, and 20% carbohydrates. Type B metabolic types would do well on a diet of low fat and relatively low protein foods with plenty of fruits, vegetables, and whole grains. Carbo types may crave sweets and refined sugar when they need healthy carbohydrates. The carbohydrates will either strengthen their weaker parasympathetic systems or speed up their naturally slow cellular oxidation rates. Nevertheless, carbo types should still include protein in most meals. They should focus on leaner, low fat meats like chicken, turkey, and fish, limiting their red meat consumption compared to protein types. Overall, their meals should probably consist of 20% proteins, 10% fats, and 70% carbohydrates, focusing mostly on vegetables with moderate levels of sugar and starch. Type C mixed metabolic types need to eat a mixture of protein type and carbo type foods. Good foods to eat for this metabolic type include turkey, chicken, beef, salmon, soy, yogurt, low-fat cheese, sweet potatoes, and bananas. These foods help mixed types support both sides of the nervous system and maintain their cellular oxidative rates. They can consume most types of fats, including those from whole milk as well as low-fat products. Overall, their meals should consist of 33% proteins, 33% fats, and 33% carbohydrates. According to naturopathic wellness expert Kate Klemer, your metabolic type can change over time. Personally, I have probably evolved from more of a mixed metabolic type to a protein type between grade school and college. This makes sense because the stresses of college have probably taken a toll on my sympathetic nervous system. Nevertheless, I do adopt a higher carbohydrate, more mixed type diet during cross-country season when I do crave more carbohydrates. We’d love to hear from you. Please let us know what metabolic type you are after taking the quiz and how that has impacted your thoughts regarding your diet. Comment below or on our Facebook page or tweet us at @flytefitness.